You thought the London Olympics were big, right? Eight and a half million tickets sold. Spectacular. But in 1910 another event did just as well, and it wasn’t a sporting event but a cultural initiative. It was the Japan-British Exhibition at White City, visited by 8,350,000 people, with 460,000 people passing through its gates in a single day (Japanese Gala Day). Okay, I admit it did go on longer than the Olympic Games – nearly six months, from 14 May 1910 to 29 October 1910. But what was it for and what did it leave behind? The idea was to present Japan as a modern, civilised, peace-loving nation and to promote Japanese products and goods. And they really went to town. The exhibition site covered over 150 acres, forty of which were under cover. It included two 400 foot long glass palaces filled with works of art and artefacts, elaborate architectural models and painted panoramas and two authentic Japanese gardens, the Garden of Peace and the Garden of Floating Islands. There were sumo wrestlers, acrobats, theatre troupes, a giant flip flap which was apparently like a giant pair of scissors which opened to raise observation cages up high and ‘afforded splendid views of the metropolis’ and a mountain railway (complete with mountain). The British halls included a magnificent display of watches, clocks, chronometers, and scientific instruments by the British Horological Institute, famous paintings from King Edward’s Loan Collection and the actual bullet that killed Nelson at Trafalgar. Entry was one shilling, and there can have been no better way to spend a shilling than on this fabulous entertainment. So when it finally closed its doors, where did it all this stuff go? Some went back to Japan but a surprising amount remained in Britain. I’ve been trying to track it down. The massive White City site, which hosted the 1908 Olympic Games, became the White City Dog Track and, famously, was home to the BBC until they moved out in 2012. All that’s left of the Japan-British Exhibition now is the Garden of Peace, which was restored in 2010 – see my post on it here. 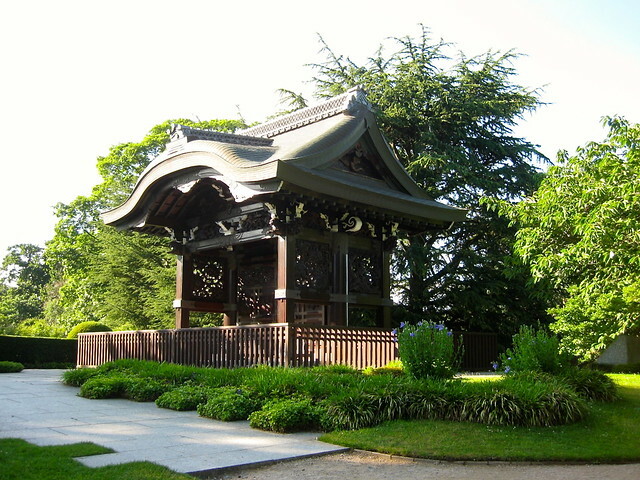 The largest prize went to Kew Gardens, which got the Chokushi-Mon (the Gateway of the Imperial Messenger), a four-fifths size replica of the Karamon of Nishi Hongan-ji in Kyoto. It’s still there, now sitting at the apex of a Japanese landscape garden. Kew also got a lot of the models of farming tools. 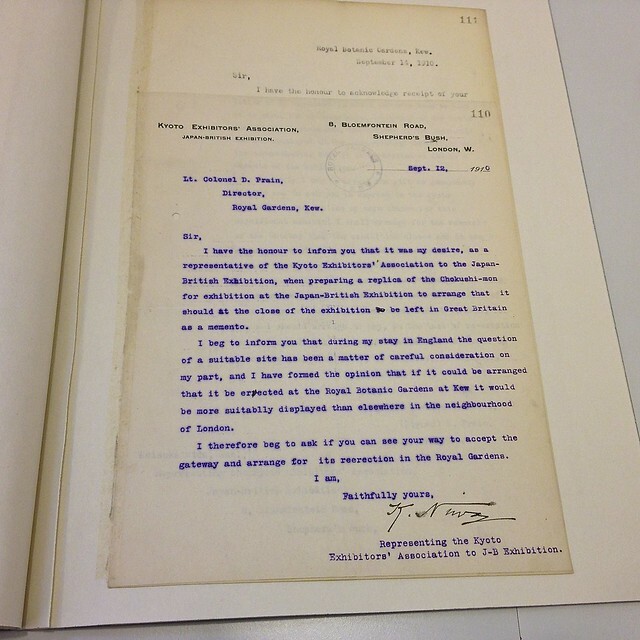 There’s a fascinating account of recently repacking them from one of the Kew interns here. And Kew got the fish – rare comet fish, never seen in this country before the exhibition (though they’re common enough today). I wonder if their descendants are still there, swimming about in the rather murky waters of the pond? The National Maritime Museum got the model ships, including this model of the warship Seiki. The Hull Maritime Museum got the entire fisheries exhibit, which may be how they got this carving of the seven lucky gods on board ship. But the thing that really fascinates me is the one-tenth scale model of the Taitokuin Mausoleum, the memorial to the second Tokugawa Shogun in Zojoji Temple in Shiba. It was commissioned by the Metropolitan Government of Tokyo, constructed by the Fine Art School of Tokyo and reproduced the gilded splendour of the original (shown in this seventeenth century painting from a folding screen) in exquisite detail. The official report of the exhibition refers to its ‘tiny bronze tiles covering artistically shaped roofs and with the exquisite work in lacquer with which the whole structure was decorated’. The good news is, we’ve still got it. It was presented to the King and still remains in the Royal Collection. The bad news is, it survived only in dismantled form. Which is a shame, as the original was destroyed in the firebombing of Tokyo in the second world war. There are reports that a project to restore the model, led by William Coaldrake of Melbourne University, got underway in the noughties but there’s no report of what happened to it then. Update – the restored model of the Taitokuin Mausoleum went on display at Zojo-ji in April 2015. See my post, a mystery solved, for details. If you want to know more about the exhibition, there is a fascinating book The British Press and the Japan-British Exhibition of 1910 edited by Hirokichi Mutsu which reproduces the newspaper articles of the time. It’s available on Amazon at an eye-watering price or you can pop down to the British Library for a look at it, like I did. This entry was posted in History and tagged 1910 Japan-British Exhibition, arts, Kew Gardens, London, Taitokuin Mausoleum, William Coaldrake by Fran. Bookmark the permalink. Thanks! I’m hoping someone will come up with some information about the model pagoda. Can you please tell me which model pagoda you are referring to? Was it the one in the 1910 Exhibition of the Negoro-ji Temple Pagoda? The model of the Taitokuin Mausoleum, the memorial to the second Tokugawa Shogun in Zojoji Temple in Shiba. Another amazing and so informative post from you. Thanks so much for sharing your knowledge with us. Incidentally the same area was used for the White City Franco-English exhibition of 1908 (see http://en.wikipedia.org/wiki/Franco-British_Exhibition_(1908)). Yes, it was, and I think some of the rides were common to both exhibitions. That’s really interesting, and started me thinking about the history of the fascination in Britain for Japanese things,,,, and set me looking at the stories, probably mostly apocryphal, of the inspiration behind the Victorian’s interest in Japan, and why something like ‘The Mikado’ could have been so immediately popular, with the mash-up of the satire on British institutions, with an ‘exotic’ location, costumes and make-up. Yes, I did a post on The Mikado a while ago which was interesting in the same sort of way. I must do something on Japonisme sometime. That is fascinating! I had a hunt for the Taitokuin mausoleum restoration project but came up empty… though I did find Professor Coaldrake’s email address (he now teaches at the University of Tokyo) so I suppose you could write to him yourself and ask! Not quite an exact parallel, but the California Midwinter International Exhibition of 1894 in San Francisco left some notable Japanese/Japoniste traces in the city, not least the Japanese Tea Garden in Golden Gate Park and the De Young Museum (whose Asian collections later became the foundation of the Asian Art Museum). Both very much worth a visit. Thanks – maybe I should do that! I didn’t know about the California exhibition – I’ll have to look out for the Japanese Tea Garden if I ever go to San Francisco..
Another amazingly interesting post. I had no idea about the Kew gateway. How about a campaign to restore the model? It could then be put in the gardens of Buckingham Palace and be a highlight of the summer viewing season. Hallo. I work for the Royal Collection as a furniture restorer and I took the Taitokuin model out to Tokyo in 9 large crates last April 2014. Phase one of an ongoing restoration programme has been completed by Japanese restorers and will go on exhibit at the original site in Sheba park this April 2015. If you google Taitokuin model, you will get directed to the Royal Collection web site and get the official briefing. Kind regards and thank you for your interest. Thanks for the update, Jane! Good to hear the Taitokuin model is going on show again. Thanks for the detailed info and good pictures. What a complex time it was becoming for Japan to find it’s identity. Visited Paris expo’s last week (on Meiji) with the VVAK.nl and found your info. Keep publishing!